23 March - 19 September. 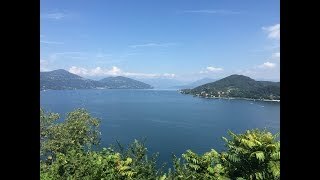 Lake Maggiore is one of the most attractive Italian lakes and Isolino is an impressive site and one of the largest in the region. Most of the 442 touring pitches have shade from a variety of trees. They vary in size, all have 6A electrical connections, 216 with water, drainage and satellite TV, some with lake views. The bar and restaurant terraces overlook the very large, lagoon-style swimming pool with its island sun deck area, water games and a canyon river, and stunning views across the lake to the fir-clad mountains beyond. Often the social life of the campsite is centred around the large bar/terrace which has a small stage inside, sometimes used for musical entertainment. A huge and impressive amphitheatre is where an extensive programme of activities and entertainment takes place throughout the season. The large poolside terrace outside the bar provides an ideal casual eating area for pizzas and ice cream. In the restaurant on the floor above you can enjoy an excellent menu and the magnificent views across the lake. The site is well situated for visiting the many attractions of the region which include the famous gardens on the Borromeo islands in the lake and at the Villa Taranto, Verbania. The site is owned by the friendly Manoni family who also own Camping Continental Lido at nearby Lake Mergozzo. Six well built toilet blocks have hot water for showers and washbasins but cold for dishwashing and laundry. Good baby room. Laundry facilities. Motorhome services. Supermarket, bar and takeaway (all season). Boutique. Gelateria. Swimming pool (23/4-18/9). Animation (23/4-11/9). Amphitheatre. Football field. Tennis court. Table tennis. Fishing. Watersports. Boat launching. Bicycle hire and guided mountain bike tours. Long beach. WiFi on part of site (charged). Good English is spoken. Bookings for dogs must be made in high season. Verbania is 100 km. northwest of Milan on the western shore of Lake Maggiore. From A26 motorway, leave at exit for Stresa/Baveno, turn left towards Fondotoce. Site is well signed off the SS33 north of Baveno and 300 m. south of the junction with the SS34 at Fondotoce.